TORONTO, ON--(Marketwired - October 05, 2015) - On the Xtalks Blog -- As the pharmaceutical industry moves away from an era of blockbuster drug development and into the presently struggling economy, there is more and more pressure on pharmaceutical companies to cut costs and get the most out of their R&D dollars. In the current age of so-called 'patent cliffs' -- when one drug going off patent could trigger a dramatic decrease in revenue -- pharmaceutical companies are increasingly seeking out strategic partnerships, as opposed to one-off transactional outsourcing of vendors. But practically, what is the distinction between the two types of collaboration -- both of which are aimed towards bringing a drug to market? 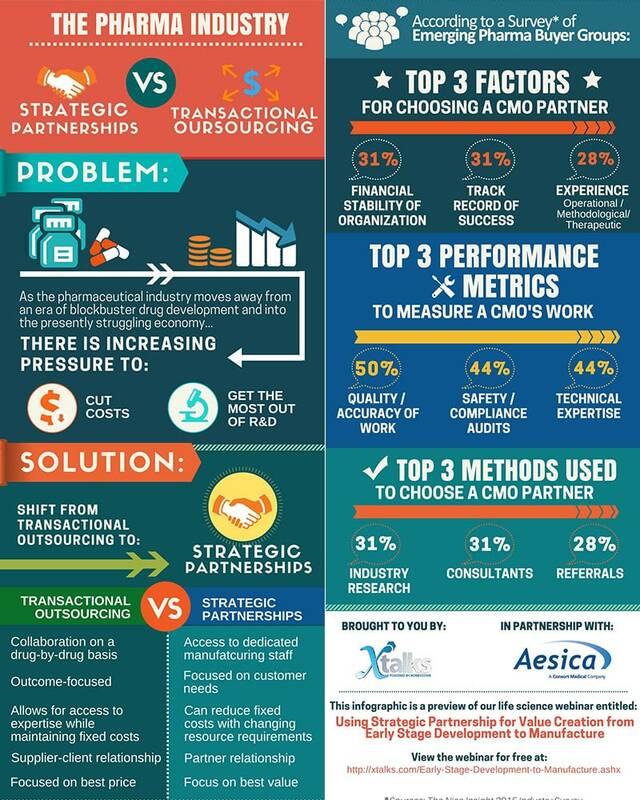 The differences between transactional outsourcing and strategic partnership formation will be discussed in the context of pharmaceutical company collaborations with contract manufacturing organizations (CMOs). Strategic partnerships benefit both the pharmaceutical developer and the contract manufacturing organization. By working on a longer-term, complex, symbiotic relationship, contract manufacturing organizations and pharmaceutical companies can both benefit from cost savings, as well as shared resources and mutual growth. Providing each company's culture fits in well with the others -- and a solid line of communication and transparency is established -- strategic partnerships can be incredibly successful. Despite the clear benefits of strategic partnerships, a report produced by the CMO Council in 2014, found that over half of all strategic partnerships fail. To understand the benefits -- and the common challenges -- associated with strategic partnerships, I spoke with Richard Fazackerley, Technical Director, Aesica Pharmaceuticals, who will be speaking in more detail about strategic partnerships in a webinar on October 5th. As the life cycle for drug development can go a very long time -- 10 to 15 years, if you're starting from early research to commercialization -- the motivator really is that long-term partnership from the very beginning. This is based on the evolution of not just value creation, but using expertise. Rather than transactional relationships, it is really looking beyond that and acknowledging that this is going to be a long strategic journey and therefore, you need a partner who can add value throughout the different phases. It is a recognition that a short-term transactional relationship doesn't have as many of the advantages of a longer-term, deeper, strategic relationship could have, in terms of both parties benefitting. This biggest advantage is the very nature [of strategic partnerships] -- unlike a transactional relationship, a strategic partnership has much more built-in flexibility. It is much more adaptive and it adds a much wider depth of service and learning opportunities to both parties. What you get with a strategic partnership is something that doesn't just focus on delivering what's payed for, you get value in many different ways. It is a two-way process so you not only get value, but you share risk. You can learn, balance capabilities, and find ways to access capabilities that you didn't have, or maybe didn't know you needed. 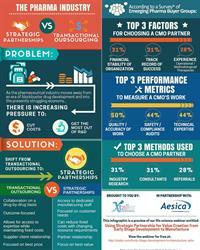 At what stage in a drug's lifecycle is strategic partnership formation the most beneficial? There is no single stage; a strategic partnership can be undertaken from the very beginning -- in early stages of drug development -- irrespective of the size [of the company]. Small- to medium-sized companies can benefit from a number of advantages; they can leverage capabilities and capacities early on. Strategic partnerships can also give smaller companies the advantage. Rather than having people look at them in terms of value of a single product, a strategic partnership can be a longer-term relationship over many different projects. From early stage development, commercialization, or the launch phase, right through to the end of the life cycle of a product. A strategic partnership -- at the highest level -- allows you to operate at all stages and adapt throughout the life cycle, but also leverage the capabilities of both parties. I think the key is to recognize that it's a long-term relationship -- by this we're talking about years or decades, rather than the short-term. The first [challenge] is impatience -- you want all the benefits today, rather than build it. It is a bit like a marriage -- it is a commitment over the long-term to build and learn, so you have to put the effort in. You need to recognize there is going to be a lot of time and effort over the life cycle of the product, and the life cycle of the partnership. What you don't want to do is get pulled into being impatient and wanting quick results, or focusing on financial reward. Clearly finances are very important, but sometimes you miss the benefit of some of the other forms of value that can be created in a strategic partnership. Transactional relationships focus on financial aspects and delivery, whereas a strategic partnership is much broader and deeper -- value in that context can be much different than simply measurable financial aspects.